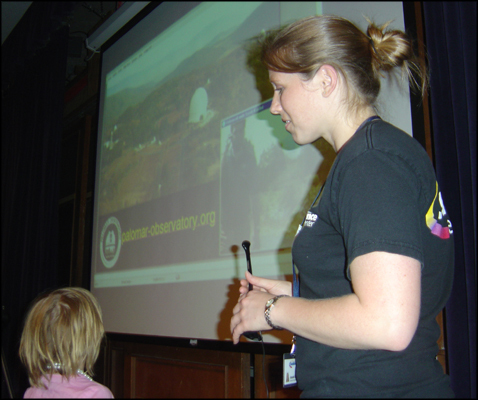 On May 10, the Reuben H. Fleet Science Center hosted an HPWREN Live Interactive Virtual Exploration (LIVE) activity featuring the Palomar Observatory in conjunction with their annual Astronomy Day. With participants ranging in age from four-years-old to eighty-years-old, the event included a real-time "tour" of several telescopes at the famous observatory. Palomar Observatory Public Affairs Officer Scott Kardel led the LIVE activity from outside the Palomar Observatory. 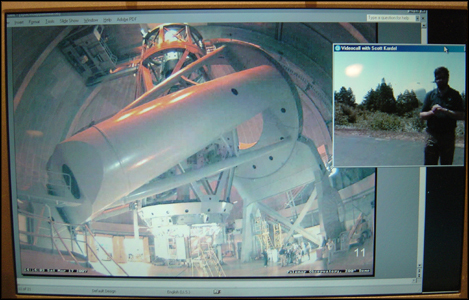 As he interacted with LIVE participants, they were able to see both Kardel and images taken from inside several of the domes, such as this image of the 200-inch Hale Telescope, which was captured by a real-time HPWREN-connected camera. The LIVE activity started outside the 48-inch Samuel Oschin Telescope where Kardel discussed its uses before moving to the outside of the 200-inch telescope. 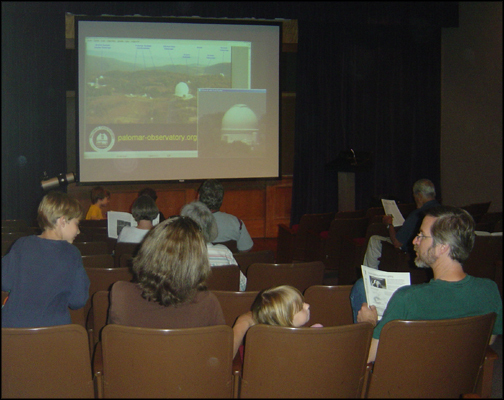 In addition to the LIVE activity itself, images taken by the observatory telescopes were also provided to participants as well as an HPWREN information booklet, the Palomar Observatory's newsletter, and a flyer regarding good lighting and poor lighting. In the latter handout, as well as during the LIVE activity, Kardel discusses how "the Palomar Observatory's astronomical research is threatened by light pollution from Riverside and San Diego Counties. Good lighting at your home can help preserve the nighttime skies for everyone." An aerial image of the observatory allowed participants to easily realize how many telescopes there are at the observatory. "Is there a benefit to using a large telescope versus a small telescope?" asked one LIVE participant. And, the answer is: different images are better taken with one versus the other. "Different telescopes can do different things," explained Kardel. "For instance, the smaller Samuel Oschin Telescope is a wide-angle telescope which makes it perfect for hunting for objects such as exploding stars and asteroids while the big Hale Telescope has a narrow field of view and takes more much detailed images of objects." "Who built those telescopes?" asks one of the youngest participants. While Amanda Lincoln (Education Programs Coordinator at the Science Center) holds the microphone for her, Kardel explains that thousands of people have been involved in building the telescopes since the early 1930s - providing an overview of the Palomar Observatory history. During the discussion, the child (along with details from her father) shared that her great-great grandfather was one of the people that worked on parts for the earliest telescopes at the observatory. "Overall, we were pleased with the outcome of the event and collected ten surveys from the almost forty participants," says Kimberly Mann Bruch, who facilitated the HPWREN participation. "The continued lesson learned is that we must equip microphones with wind-blockers - especially when LIVE activities occur atop the windy Palomar Mountain - all of those surveyed agreed that there was difficulty hearing Kardel at times. Other than the audio difficulties, the activity was quite successful with nine of the ten surveyed participants agreeing that they are more likely to visit the Palomar Observatory because of this LIVE activity." The Palomar Observatory is open to the public on a daily basis from 9am to 4pm; details about visiting the observatory are found at http://www.astro.caltech.edu/palomar/visiting.html. The Reuben H. Fleet Science Center hosts planetarium shows on the first Wednesday of every month at 7pm; details are found at http://www.rhfleet.org/site/astronomy/skytonight.html. HPWREN LIVE is currently in experimental stages, as the team tries out an array of hardware, software, and hands-on activities to accompany the events. The next scheduled LIVE activity is May 30-31 at the National Geographic Bioblitz in the Santa Monica Mountains, where thousands of scientists, volunteers, and community members will gather to conduct a 24-hour species inventory. The Bioblitz HPWREN LIVE activity will involve a roving junior scientist equipped with a backpack that allows transmission of audio and video to a stationary booth at the event's main location from various habitats throughout the overall inventory area. Booth passerby will be able to communicate in real-time with the roving junior scientist.